The deal signed in Tokyo by the EU's top officials and Japan's Prime Minister Shinzo Abe is the biggest ever negotiated by the EU and creates a free trade zone covering nearly a third of the world's GDP. Tokyo: The European Union and Japan on Tuesday signed a sweeping free trade deal which officials called a "clear message" against protectionism. The deal comes amidst the ongoing US-China trade war. "We are sending a clear message that we stand together against protectionism," EU Council President Donald Tusk said. "Together we are making -- by signing this agreement -- a statement about free and fair trade, we are showing that we are stronger and better off when we work together," added Commission head Jean-Claude Juncker. The massive deal was was signed as President Donald Trump unsettles allies and provokes rivals with his aggressive "America First" trade policy. Both the EU and Japan have been hit with new US tariffs despite their longstanding alliances with Washington. Juncker said the deal sent a message that "trade is about more than tariffs and barriers, it is about values". "There is no protection in protectionism," he said. 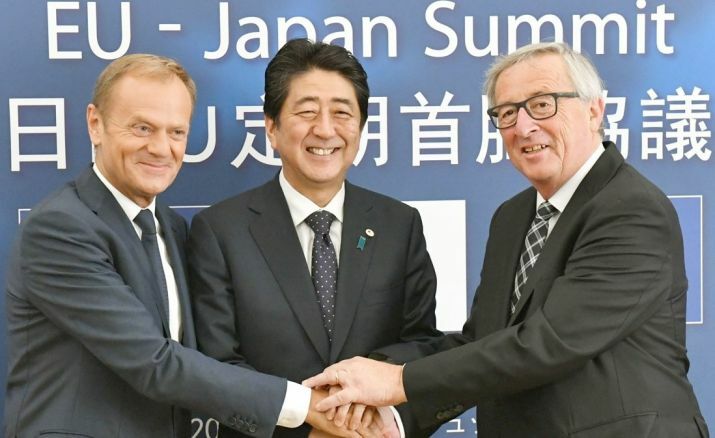 Abe, standing alongside the two EU officials, said the agreement, "shows the world the unshaken political will of Japan and the EU to lead the world as the champions of free trade at a time when protectionism has spread".